Today be an important day. Whether more pages will be added to me journal or not will be decided by the outcome of this battle. The Rogues were after things that I had worked hard for. Me men were preparing for a battle and I thought that I would use this little time to write an entry about a memory. Not really a memory but it goes back to when we were given a coin by Nina's friends. We did not immediately board our ship, we instead decided to celebrate our victory by smuggling into a food festival and eat even more. The Renaissance has been very active in recent times with food festivals making it a hot spot for connoisseurs. This would be my third run to The Renaissance for exotic food and festivals. 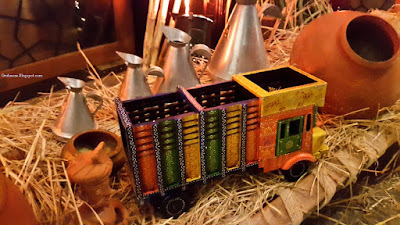 The occasion this time was Baisakhi or the harvest festival of the Indian state of Punjab. Baisakhi celebrations are known for fun, frolic and good food. 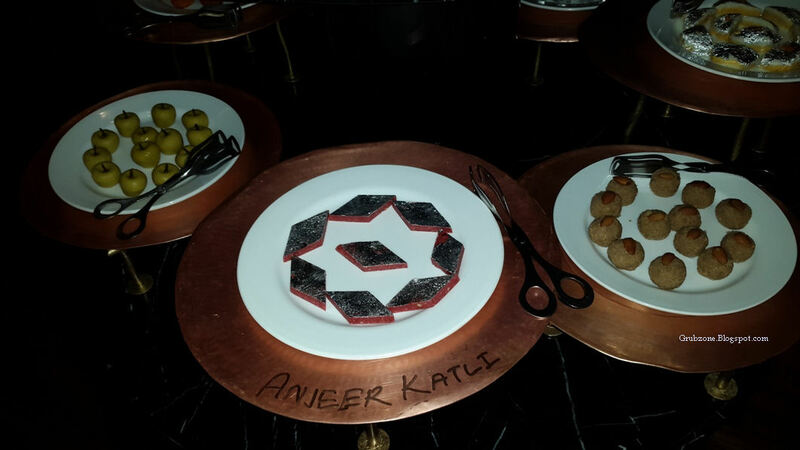 Nawab Saheb captured the essence of this celebration in its culinary form. I guess they integrated a bit of frolic too as visible from the pictures. Nawab Saheb retained its original royal court decor but had a bit of Baisakhi decorations at the entrance. How can one start a Punjabi meal without a Lassi in a Kullhad(Earthen Cup)? 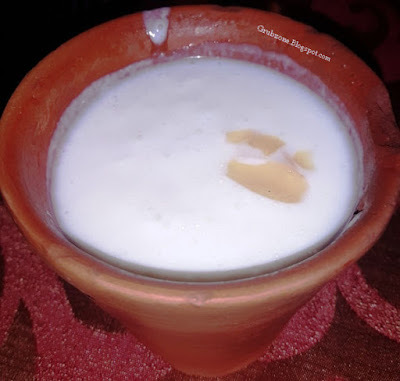 The lassi was a little thin for my liking but passed well with the theme. 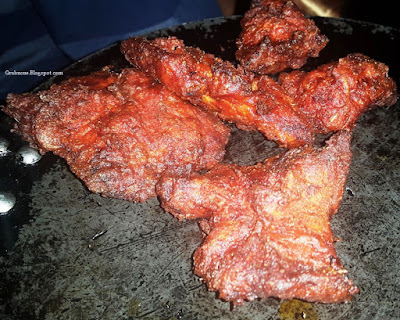 Multan Punjab Di Pasliyan : Multanese Punjab Ribs in English. I apologize for the bad imagery but Nawab Saheb's dim lighting makes it a hard job for a wannabe food photographer with a Samsung Phone. These were charcoal grilled Lamb ribs marinated in Indian spices. A bit dry as the meat was too well done but tasted great as an appetizer. The smoky flavor lingered around in my mouth for a while. Captain : Eating this Punjabi food makes me want to put on a Punjabi accent. First mate: Leave it mate, you don't want to sound like Irrfan Khan doing Baloo's voice in Jungle Book. 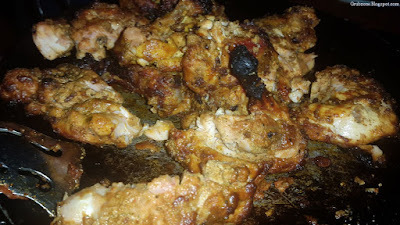 Bhatti Da Murgh - This was a thigh cut from a chicken with the bone. The meat was juicy and full of flavors. This was more ethnically Punjabi in origin than some other treats served in the night. Amritsari Macchi Taliyan was Batter fried sole fish rubbed with chili and spices. The crust preserved the heat inside. The interior was quite spicy and combined with the heat from the cooking, it felt quite hot. The preparation though did feel a bit pedestrian as opposed to the first two appetizers. 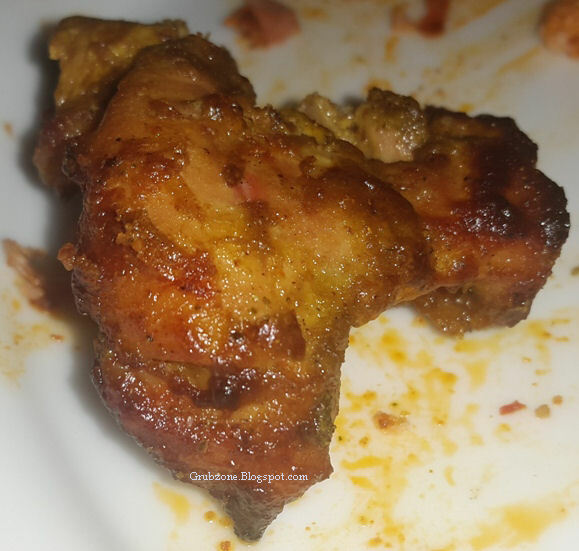 Jalandhar De Tikke was an average Chicken Tikka if one goes by flavor alone. The preparation did not feel very Punjabi in flavor. It felt closer to Lucknowi cuisine. The crust was overdone and the flavor of the interior felt uninspired. Apart from the solitary sample piece that you see in the picture, I did not have more of this. Keeme Di Seekh - These Lamb skewers made out of minced meat were perhaps the biggest disappointment of the day. These tasted bland, dry and the crumbly. I had just taken one piece and I found myself unable to finish that. It was easily passable. Moving to the mains, one has to admit that the mains trumped the appetizers in the orders of magnitude. Khaasam Murgh (White colored gravy) was the weaker of the main options. However the opinion was divided on this one with several folks across the table enjoying it. For me, the gravy tasted different from what it its appearance suggested. I am not too fond of curries where tomato feels dominant. Dal Makhani(Next To Khaasam) was a good old Urad Lentil dish that was perfect in its preparation. Just the right amount of butter, spices with a lovable thick consistency - this Dal found everyone's support on the table. Makhni Kukkad De Tikke was undoubtedly the dish of the night. 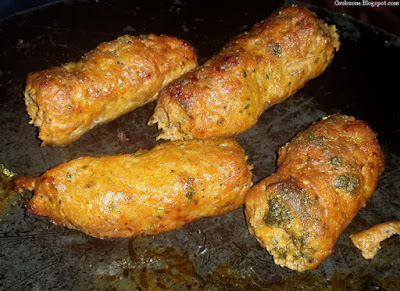 It was so good that I helped myself to three servings of the same and sincerely hoped that this dish would be a permanent resident on Nawab Saheb's menu. 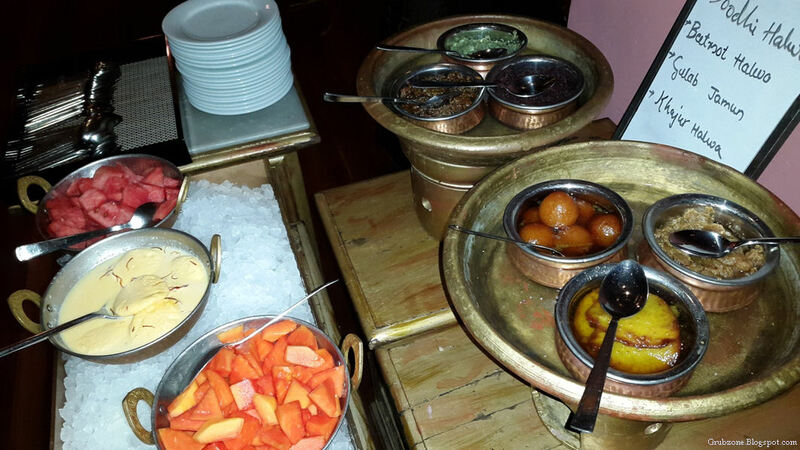 It combined two of the most celebrated North Indian dishes into one mouth watering concoction. 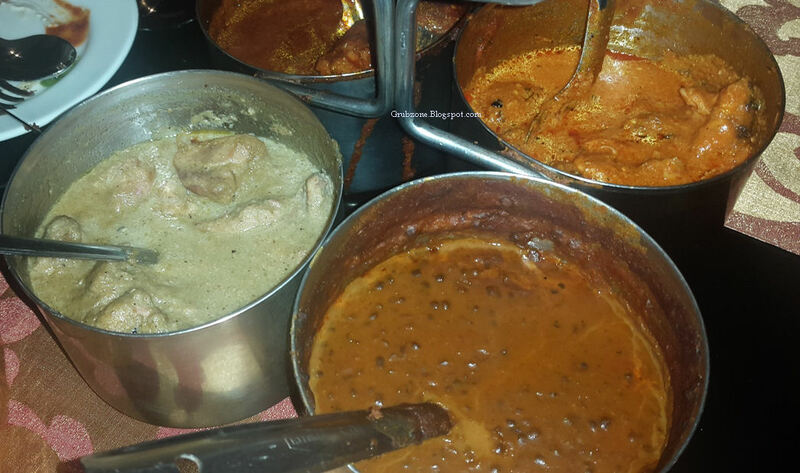 It used the typical Butter chicken curry made of tomatoes, cream and cashews and combined it with Chicken Tikka. So it was a Butter Chicken with a Tikka flavor. Its amazing how well these two flavors coexisted in a single dish. 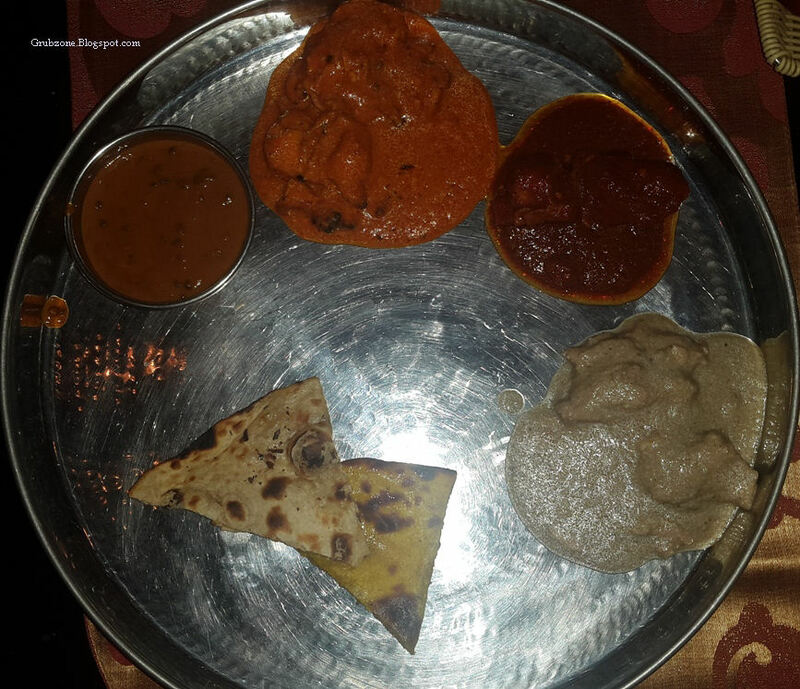 This dish alone was a good enough reason to dine at Nawab Saheb. Naabe Waala meat(Dark Red dish on the plate) was another star of the night. 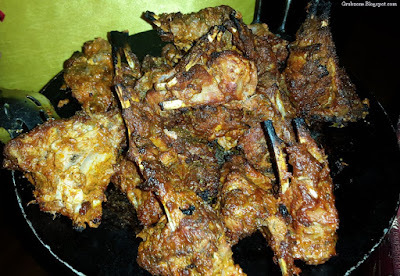 This lamb dish was tangy and spicy with juicy chunks of mutton thrown into the curry. Though the gravy was thinner than the other mains, the dish was quite enjoyable and was more about the meat and less about the liquids. 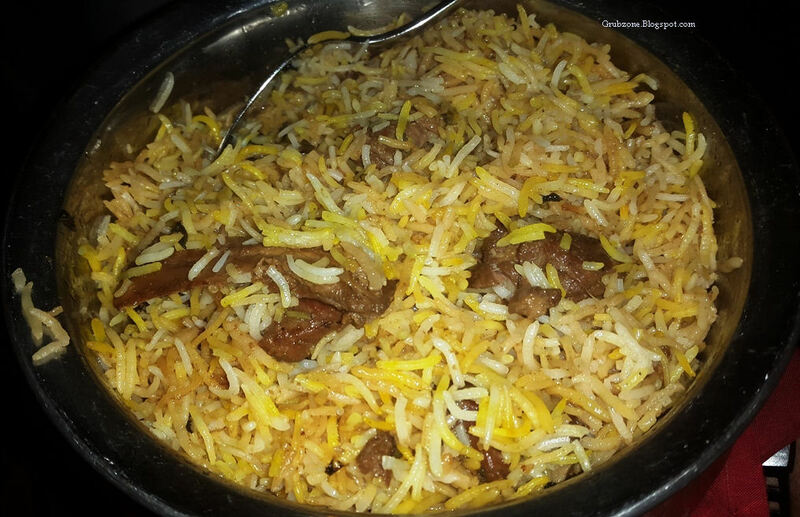 Memna Pulao was made of tender young Lamb and infused with aromatic spices. I am told that it had a bit of Kevda essence in it as well. The Pulao was absolutely one of the best I have had. The restaurant was very professional to call it a Pulao and not pass it as a Biryani like many other places. But even for a well versed eater like myself, this could have easily been mistaken as a Mutton Biryani. A little known fact is that Pulao is Punjabi while Biryani is not. Captain : This has to be the best Pulao I have ever eaten. Its so good, I can already feel the protein healing me wounds. First mate : Aye, its better to stab at food rather than some dumb thieves. Once again, Renaissance's old issue with thematic desserts repeated itself. 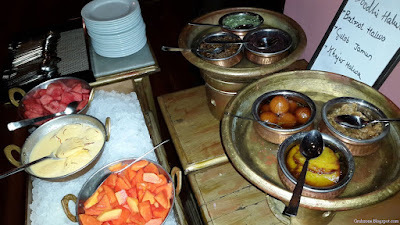 The desserts were a classical mix of generic North Indian desserts. All good and sumptuous but still not Punjabi. The service could have been better. There was a long gap between the appetizers and the main. There again was an issue with water as the servers did not sweep to check for empty water glasses. Much of these problems being similar to those encountered at Lake view last week in The Renaissance. The Pricing varies from INR 2000 to 3000 depending on the set chosen. For INR 2500 The non vegetarian set was well worth the moolah. Renaissance has frequently been hosting exotic food fests. Each comes with its own theme and has that feel that makes you want to visit em all. The core of the fest - the food had more ups. The downs would be the service and the lack of thematic desserts. But the food was good and the generic desserts worked too. 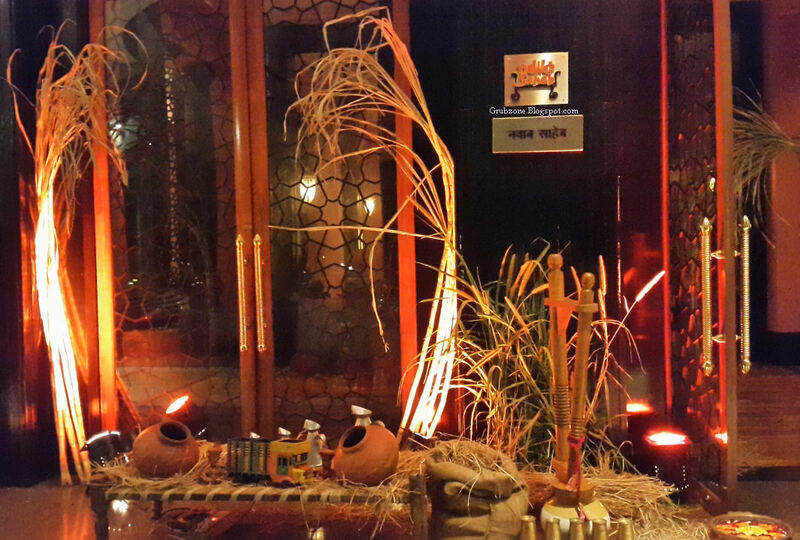 All in all, another reason to dine at Nawab Saheb. First Mate : Ya know, the leader of the attackers looked familiar. Captain : Who would he be? First Mate : A brute mercenary named Rocky. Captain : Is he the Captain of the black sailed ship? First mate : I doubt. He is too dense to be a crew leader.